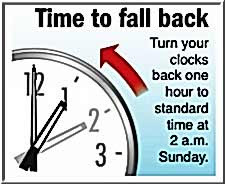 So not only is it Halloween tonight, but also the night many of us switch back to standard time following a summer of daylight saving time. There was a time – and it isn’t that long ago – when time was so totally relevant, that there were in excess of 100 different “time zones” in the United States. This is due to the simple fact that when the sun was right over the local church steeple, it was high noon. 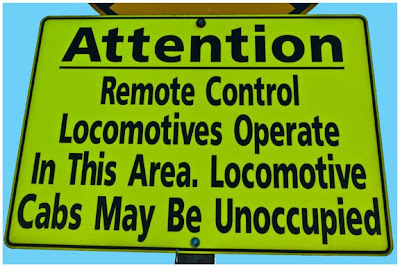 Most citizens do not know that it was the railroads that eventually forced the current system of time zones, four on the lower 48, the 5th in Alaska, and the 6th in Hawaii. And Russia, the country Sarah Palin can see from her kitchen window, has 11 time zones! I come from a generation wherein Halloween was not an excuse to range far and wide to extort candy from strangers and wreak havoc. That's not to say there wasn't the occasional t-p incident. But for the most part, our activities were neighborhood centered. We only went out for an hour at the most, always following the 5-6pm-dinner hour. At most houses, people came to the door to see what clever costume you had cobbled together, guess whose kid you were, and “reward” you for your cleverness and effort at disguise, with a candy or treat. And always ended up at someone’s house, the McDonald’s house, for example, for an evening of playing games, dunking for apple’s, and the special treat of pumpkin pie with a ton of whipped cream and hot apple cider. It was a world without computers, x-boxes, wii’s and cell phones. It wasn’t so much a “simpler time;” it was a more civilized family values time. We learned hobbies, developed skills, and looked to family for interaction and entertainment. And if you had a TV, the National Association of Broadcasters restricted commercial content to 20 minutes or less per hour and did not allow the gawd damn volume to be pumped up. And personal products were exactly that. Personal. 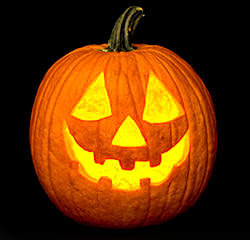 You know, if a kid plays his cards right tonight, he (or she) will elect to turn the clock back earlier, earning an extra hour to beg for candy! 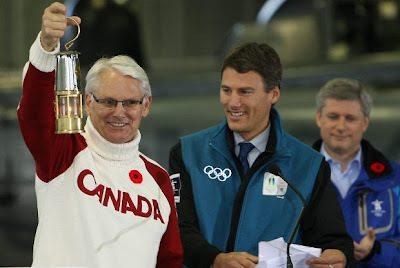 BC Premier Gordon Campbell holding Olympic Flame in miners lamp, Vancouver Mayor Gregor Robinson, and Prime Minister Stephen Harper. The Olympic Torch arrived this morning from Greece, at the Victoria International Airport (formerly known as Patricia Bay Airport) on board a Canadian Forces CC-150 Polaris. 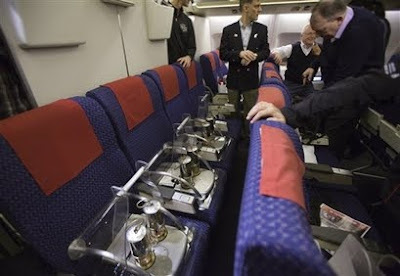 The Olympic flame had its own row of seats on the Canadian military plane. There were actually four flames and six lanterns aboard the flight - the logistics of the coming 106 day relay mean organizers must have several lanterns to ensure one is always ready to go. The 106 day tour covering 28,000 miles through more than 1,000 communities, will be carried by more than 12,000 runners, and is scheduled to arrive in Vancouver on February 12, 2010. 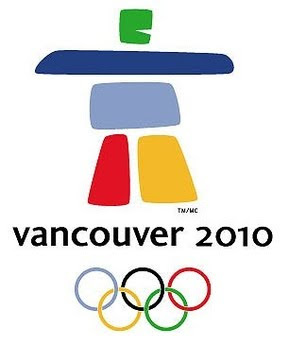 Bookmark this site to follow the flame to Whistler! While there certainly is a place for showcasing finely tweaked photographs, here, railroad photography isn't all calendar art or coffee table book material. 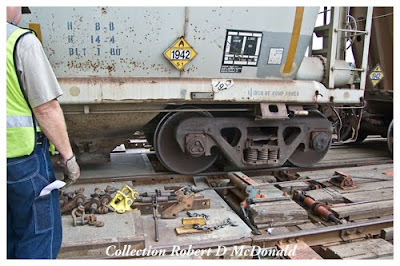 Here we show the plethora of real railroading activities that take place in the real world rain or shine. There may be backlight or front light or no light. And the scene may be squeaky clean or down right gritty. The humble transfer caboose lacked the lush overnight facilities of her big over-the-road sisters. But she provided a warm place to get in out of the rain, or fog, or snow. A place to refresh with a cold cup of ice water, a hot cup of soup, or burnt coffee. A place to gobble down a meat loaf sandwich. A place to check the switch list, exchange some friendly banter. A place to wait for superior trains to pass. 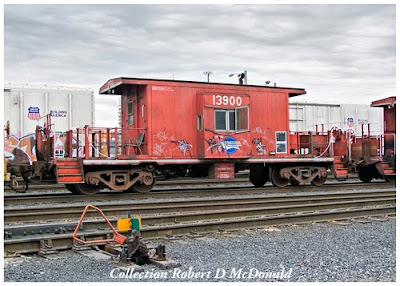 There is something poignant about the slow, undignified death of this transfer caboose. 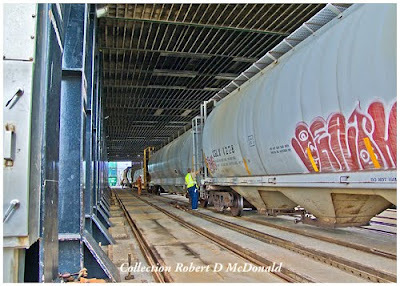 Never repainted following the merger of Missouri Pacific with the Union Pacific, MoPac 13900 serves out her final days, disfigured with graffiti, trudging pointlessly back and forth as one of several “idler cars” used in working rail barges. 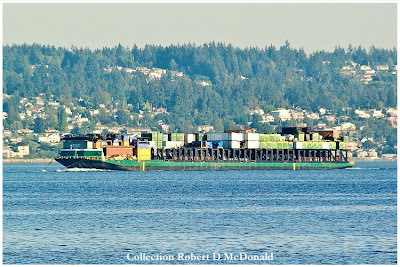 After seeing a massive combination rail and container barge pass by Port Townsend a few months ago, I was able to identify the carrier as Alaska Railbelt Marine, based in Seattle. 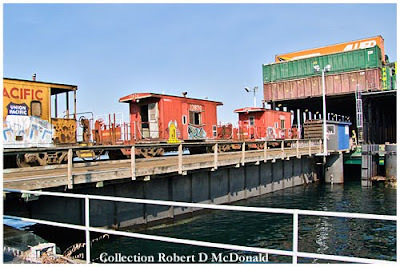 Further, I discovered that the rail barge connection was a permutation of the old Crowley Maritime “HydroTrain” service, connecting the Alaska Railroad at Whittier to the lower 48 through a facility located at Seattle’s Harbor Island transportation complex. 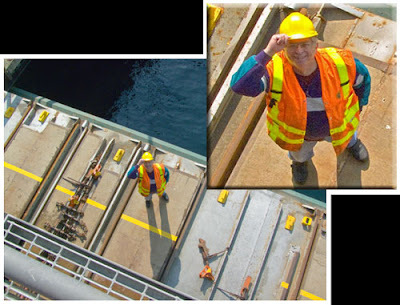 One thing led to another and I was invited by David Byrne, Operations Manager for Alaska Railbelt Marine (ARM) to have unlimited access to the rail barge during loading operations. ARM is a subsidiary of Lynden Inc., who got its start as Lynden Transport, whose history is closely linked to the rapid growth of Alaska following WWII. 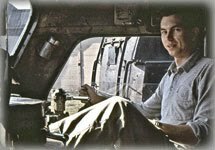 From their humble beginnings running a fleet of trucks on the Alcan Highway, to their present day multi-discipline worldwide operations. 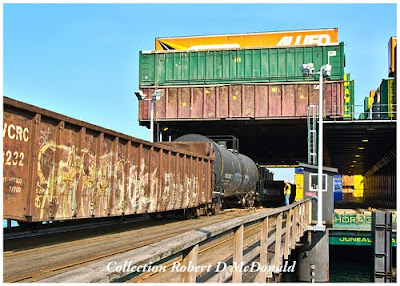 In Part 1, we presented a brief history of rail transport to Alaska and detailed Alaska Railbelt Marine's one of kind combination rail/container freight barges that provides weekly sailings to Alaska. Our “story” continues. 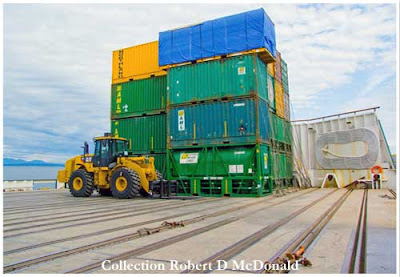 An overhead rack with a capacity of up to 190 40’ or 53’ containers stacked up to 3 units high, with provision for electrical service while en-route for units requiring temperature control. And eight rail tracks with a capacity for up to 50 “average” size rail cars. 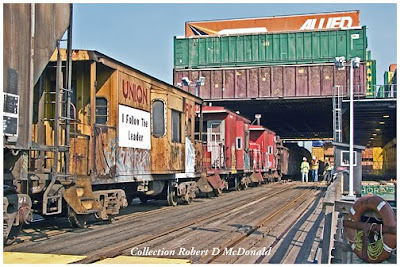 The overhead racks and forward deck spaces are loaded at Alaska Railbelt Marine's sister company Alaska Marine Lines (AML) on West Marginal Way in Seattle, just up stream from the Spokane Street and old Northern Pacific railroad bridges. Overhead rack loading is completed by Tuesday night. 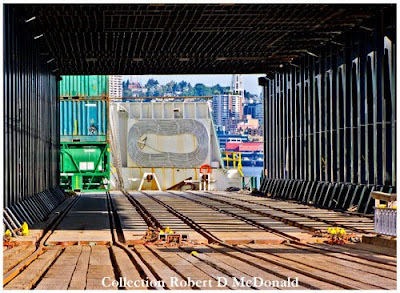 Video shows the barge being transferred down the Duwamish River and over to Alaska Railroad's marine rail bridge terminal on Harbor Island for loading on Wednesday. Incoming cars from the Burlington Northern and Union Pacific are aggregated in an interchange yard located on Harbor Island, adjacent to the loading rail bridge. 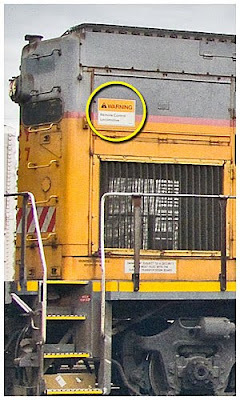 Yet another warning sign on the locomotive simply reads “Warning Remote Controlled Locomotive.” However, a quick check with the ground crew informed me that due to the "delicate" nature of loading a rail barge, a human engineer would be in the cab! 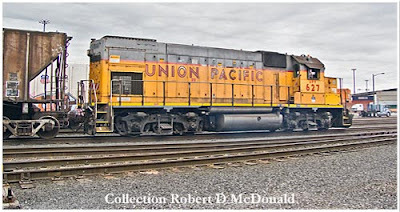 On this day, UPY (Union Pacific Yard) 627 was assigned to work the barge. She was built by Electro Motive Division (EMD) as Missouri Pacific 1627, serial number 787183-13, in September 1959. Later, when merge madness was in the air, Union Pacific acquired Missouri Pacific, and she was renumbered UP 1627 January 1997. She was finally designated as a "yard" (Y) locomotive, UPY 627 in April 2001. 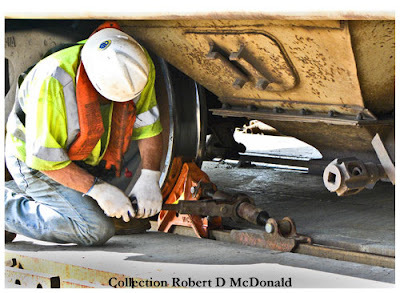 Union Pacific provides the locomotive and ground crew for loading and unloading. 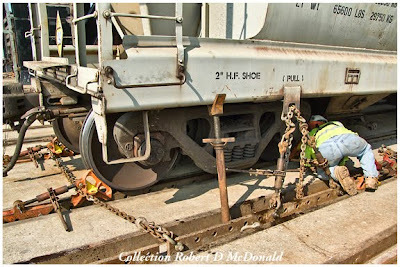 To keep the weight of the locomotive off the rail bridge, a set of “idler cars” are inserted between the locomotive and the departing loads. Here at Harbor Island, a gaggle of bay window cabeese and a beat up hopper car is used. On each corner, a screw jack is used to lift the car off its springs, to eliminate harmonic rocking of the cars into each other. And a hook and chain ratchet is used to draw down the car, securing it to the deck. All four "corners" of each and every car is secured in this manner. Cars at either end of the string are further secured with wheel chocks. Depending on the number of cars, loading can take up to four hours. Throughout the process, safety and thoroughness is emphasized. There is absolutely no margin for errors or missed tie downs. The safety and integrity of the shipment must be assured. 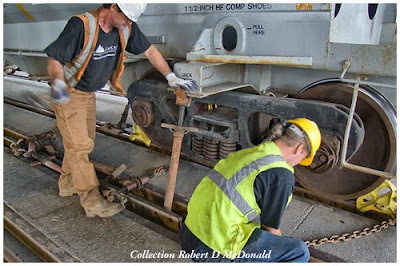 My hosts, Dave from ARM, and Kevin from Alaska Railroad, keep a close eye on the loading and securing operation. Once this barge is in the open ocean, everything must stay in place. 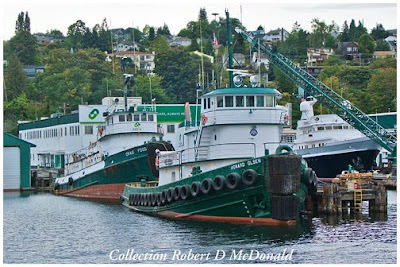 Alaska Railbelt Marine has a long-term contract with Western Towboat, headquartered up on the Lake Washington Ship Canal near Beautiful Downtown Ballard. 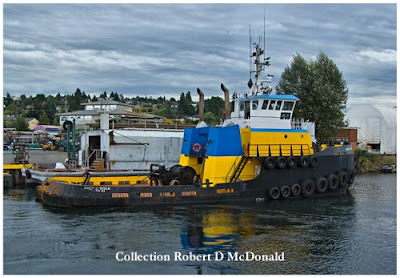 Western Towboat is a family run operation with magnificently appointed tugs that they design and build themselves. Pride in the family tradition is immediately apparent. My Dad spent a lot of his time after retiring, watching Western build new towboats. 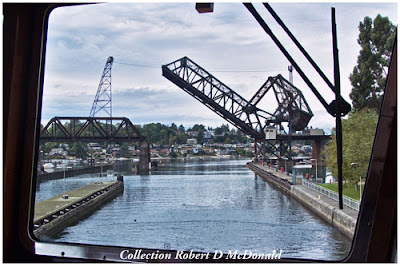 Ironically, you can throw a crescent wrench between Western Towboat on the north side of the ship canal, across to the south side and the Foss Maritime tie up! 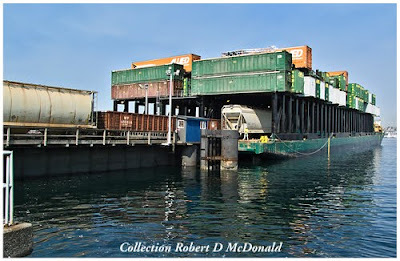 Foss handles the Canadian National "AquaTrain" rail barge link to Whittier from Prince Rupert! The tug assigned this trip was the 5,000 horsepower M/V Alaska Titan. She was launched in the spring of 2008. Western Towboat builds their boats right there in their yard and runs them down into the ship canal for launching as you will see in this video clip of the launching of the Alaska Titan. Since it is difficult to get a picture of the tug you are on, this shot of her nearly identical twin (shorter by 12'), the M/V Pacific Titan. 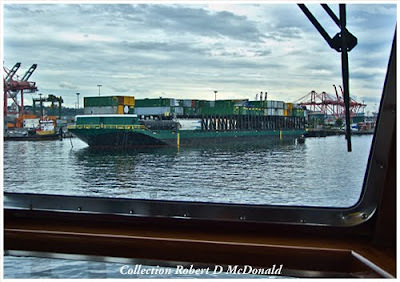 She followed us around through the locks, heading up the Duwamish River to pick up her assigned barge, a weekly sailing to a handful of ports in South East Alaska, with a barge loaded with containers. 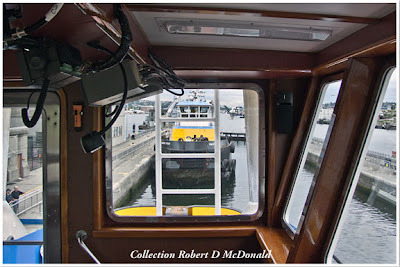 These tugs are more like a motor yacht than a working tugboat, beautifully appointed. Clearly with crew comfort uppermost in design and finish. Nothing compared to the Alaska Freight Lines Miki-Miki class tug M/V Martin (LT143) I worked on one summer, towing between Seattle and Anchorage. 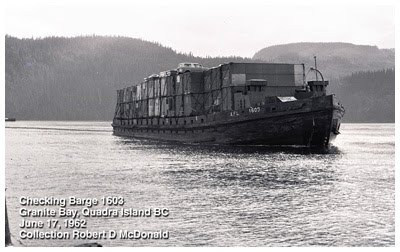 This was the state of the art container transportation in the 1960’s. 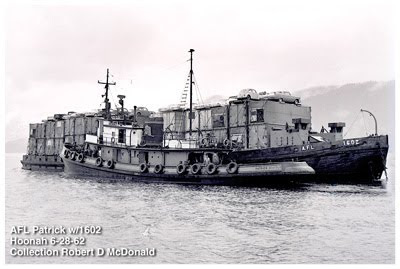 Alaska Freight Lines (AFL) had purchased a fleet of former WWII Army Barge, Cargo, Lighter (BCL's). Break-bulk cargo went in the holds, along with twenty-foot containers. The hatches were sealed, and up to 36 40-foot containers were stacked two high, with a layer of cars, buses, boats and trucks on top of that! 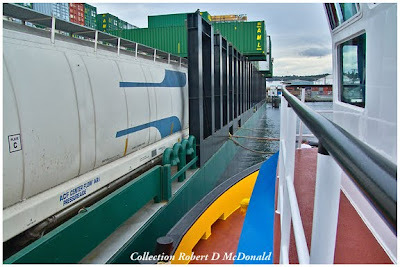 Gen-sets located in the two forward deck-houses supplied juice to reefer containers to keep the produce (or beer!) cold. A bright white light let the tugboat crew know the gen-sets were running. 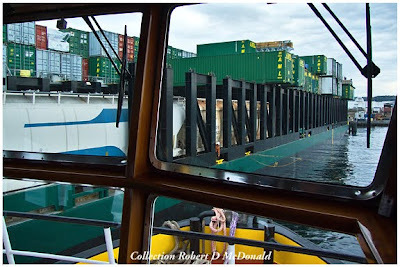 Twice on the run to Anchorage from Seattle, we pulled along side the barge to check tie down chains and make sure the Thermal King reefers where running. It was “Shorty” the cook who clued me in to volunteer to go on the barge, for which I got extra pay. Being the most nimble of the crew, I climbed the 16-foot ladder to check temperatures on the Thermal Kings. 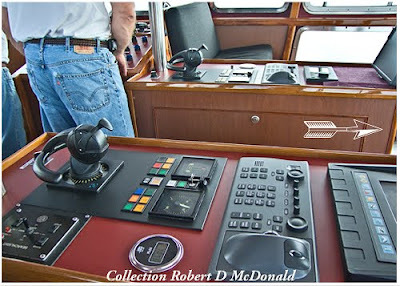 The thing that struck me foremost in the wheelhouse of Western's Alaska Titan is that there is no steering wheel. 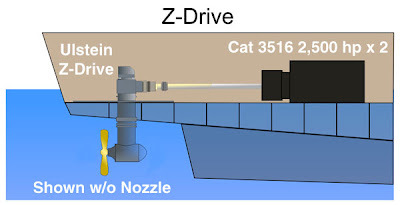 Referred to as a "Z-Drive" propulsion system, (because the drive train roughly resembles the letter "Z") the propeller, surrounded by a nozzle, not only drives the vessel, but can pivot a complete 360 degrees for steering and maneuvering the vessel, eliminating the need for rudders. 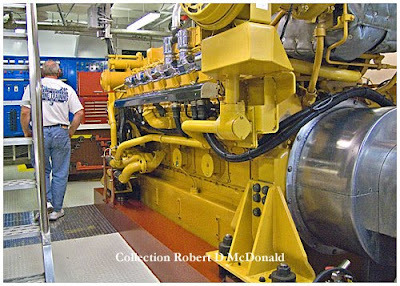 The Alaska Titan is powered by two Cat 3516 BLS diesels, for a total of 4,200 horsepower. The drive shaft from the engine enters the Z-Drive transmission box from the right - small part of the shaft shroud is visible. Power is transmitted down to a second gear box, mounted on the propeller. 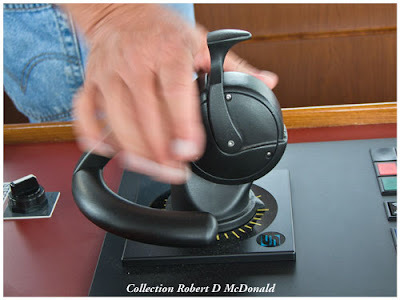 Similar to a video game, the multi-purpose joystick controls vessel movement. Arrow points to bow. Port and Starboard Z-drive controls. Joystick controls direction and engine speed. Flat screen upper right is radar! Settles on either side of control console provide excellent viewing for guests like me! 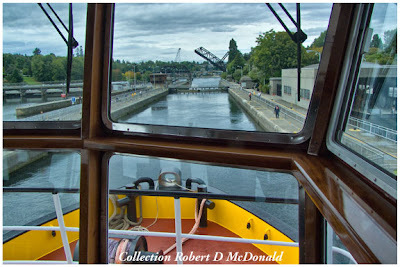 After leaving Western's tie-up we traversed the Lake Washington Ship Canal through the Hyram CHittenden Locks. There was no big bulky paper navigation chart. In lieu of the tubes of charts, there is a flat screen display. GN Bridge 4, as few can enjoy it. As you can see, wheel house view is unobstructed. 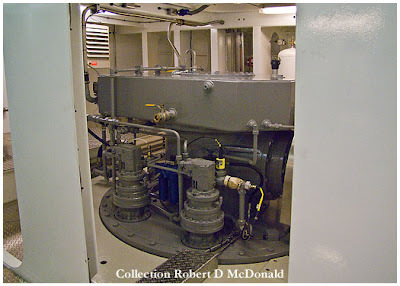 As I was sitting in one of the pilot house settles, looking around at the floor to ceiling windows, I wondered just how terrifying this would be out in the Gulf in a blow. I think this would allow you to see TOO much! Click and Pan - Abeam Magnolia Bluff - view off port side. Bow to the right. Click and Pan - Seattle's first skyscraper, the 42 story Smith Tower, survives just to right of center. Lenticular clouds hang over Mt. Rainier. Safeco Dome under right windshield wiper. 3 photo composites. 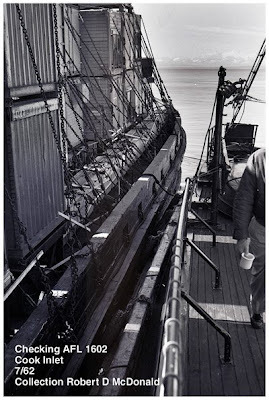 By the time we arrived at Harbor Island, the deck crew had completed the last tie down, and the barge was ready to go to Alaska. The final step is for the towing bridle on the barge to be retrieved and connected to the towing machine onboard the tug. So here we see the M/V Alaska Titan made up with the F/B Whittier Provider. I has taken the better part of the day to load, secure and connect with the tug. Repeated every Wednesday. 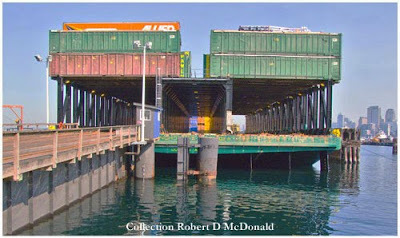 A study released in 2005 details the impact rail barge, container, and roll on/roll off services have on shipping the goods to Alaska. While the numbers are a few years old, it will give you an idea of the importance of these services. Depending on the weather, the tug and barge will arrive in Whittier in 6 or 7 days, and the process reversed. 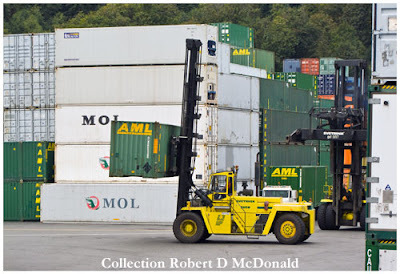 After the rail cars are unloaded, high reach fork lifts will remove the containers from the over head rack, and the barge will be reloaded for her return trip to Seattle. Be sure to visit Alaska Railbelt Marine Lines web site for a gallery of photos showing tows at various locations in Alaskan waters. This was a remarkable adventure for me. I hope I have presented it clearly to you for your enjoyment. 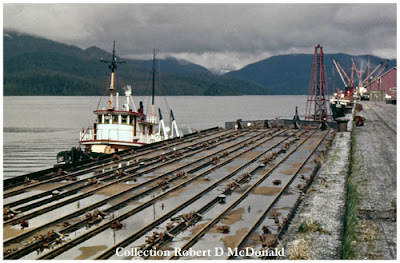 This tied a bow around my experience with rail barges and railroading beginning back in 1957, riding on the Miki Class M/V Comet (LT 393) to the rail bridge in Prince Rupert, as I have written about in the beginning of this blog. 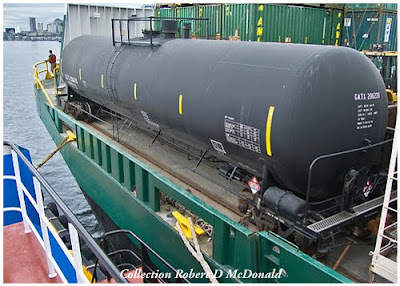 And making things so much easier were David Byrne of Alaska Railbelt Marine, and Kevin Meier of the Alaska Railroad. They were great hosts, patiently enduring questions they have probably answered a hundred times, allowing me full access to the barge, wearing my hardhat and visibility vest! And I cannot say enough about Bob and Rick Shrewsbury, co-owners of Western Towboat in Ballard for allowing me to travel with skipper “Arv” aboard the “Alaska Titan.” That was a very special treat for this old duffer to be able to ride a magnificent vessel! This story required two trips to Seattle from my home in Port Townsend to complete. 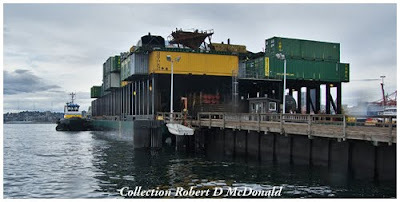 During the first trip, the Union Pacific had just begun loading the barge, when David Byrne called Western Towboat to find out when the tug would be arriving at Harbor Island to pick up the rail barge. Apparently, they were getting ready to cast off. I heard Dave ask if they had room for a visitor, and if they would wait for us to get up to Ballard from Harbor Island! Totally unscripted and unexpected! Despite the fact I didn't have a single shot of cars loading onto the barge, there was no way on gods green earth that I was going to miss a tugboat ride! 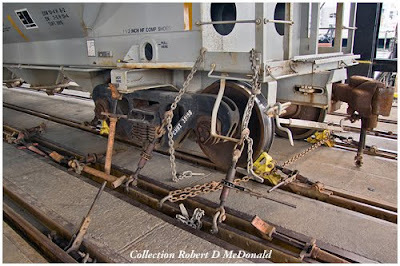 So I had to return the following Wednesday to shoot all the rail details that got “derailed” with the boat ride! Returning home the second Wednesday, I took the ferry out of Edmonds to Kingston, about 12 miles north of Seattle. 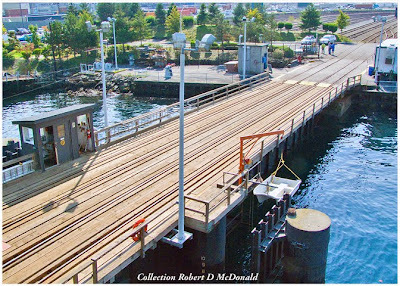 I got loaded on an outside lane on the lower port side of the Washington State Ferry M/V Spokane. A Great Blue Heron flies over the northbound Gulf Titan abeam Edmonds Washington north bound to Whittier. Space Needle pokes her head above Magnolia. I happened to glance up as we were crossing the Sound, and low and behold, there was the “Gulf Titan” pulling on the F/B Anchorage Provider heading up Puget Sound, providing me with the perfect ending shot my grand adventure!